The No. 1-ranked Florida softball team lost a 1-0 game to the Baylor Bears on Sunday at Katie Seashole Pressly Stadium despite senior pitcher Stacey Nelson's one-hit performance that did not yield an earned run or a walk. Baylor scored an unearned run in the fifth inning on a hit and a pair of UF errors. Florida had three hits in the loss, but left five runners on base. Kim Waleszonia, Francesca Enea and Megan Bush each had a hit in the loss. The Gators fell to 2-1 while Baylor improved to 1-2. Baylor freshman pitcher Whitney Canion struck out ten batters in the win. 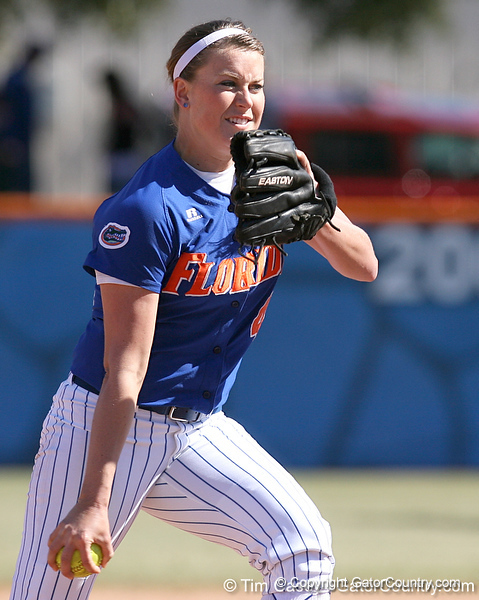 Florida senior pitcher Stacey Nelson winds up during the fifth inning of the Gators' 1-0 loss to the Baylor Bears on Sunday, February 8, 2009 at Katie Seashole Pressly Softball Stadium in Gainesville, Fla.